1 - The user invokes the login() method of the Identity bean. 1.1 - The Identity bean (after performing a couple of validations) invokes its own authenticate() method. 1.1.1 - Next the Identity bean invokes the Authenticator bean's authenticate() method (which has a return value of void). 1.1.2 - To determine whether authentication was successful, the Identity bean invokes the Authenticator's getStatus() method, which returns a SUCCESS. 1.1.3 - Upon a successful authentication, the Identity bean then invokes the Authenticator's postAuthenticate() method to perform any post-authentication logic. 1.1.4 - The Identity bean then invokes the Authenticator's getAccount() method, which returns an Account object representing the authenticated agent, which is then stored as a private field in the Identity bean. The authentication process ends when the Identity.authenticate() method returns a value of true to the login() method, which in turn returns an authentication result of SUCCESS to the invoking user. The first thing we can notice about the above code is that the class is annotated with the @PicketLink annotation. This annotation indicates that this bean should be used for the authentication process. The next thing is that the authenticator class extends something called BaseAuthenticator. 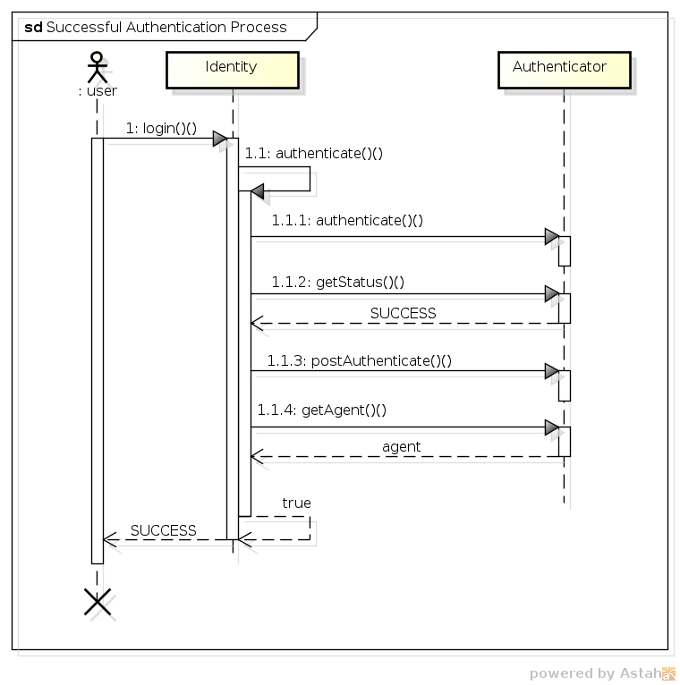 This abstract base class provided by PicketLink implements the Authenticator interface and provides implementations of the getStatus() and getAccount() methods (while also providing matching setStatus() and setAccount() methods), and also provides an empty implementation of the postAuthenticate() method. By extending BaseAuthenticator, our Authenticator implementation simply needs to implement the authenticate() method itself. We can see in the above code that in the case of a successful authentication, the setStatus() method is used to set the authentication status to SUCCESS, and the setAccount() method is used to set the user (in this case by creating a new instance of User). For an unsuccessful authentication, the setStatus() method is used to set the authentication status to FAILURE, and a new FacesMessage is created to indicate to the user that authentication has failed. While this code is obviously meant for a JSF application, it's possible to execute whichever suitable business logic is required for the view layer technology being used. This line of code injects the credentials that have been provided by the user using CDI's @Inject annotation, so that our Authenticator implementation can query the credential values to determine whether they're valid or not. We'll take a look at credentials in more detail in the next section. You may be wondering what happens if you don't provide an Authenticator bean in your application. If this is the case, PicketLink will automatically authenticate via the identity management API, using a sensible default configuration. See the Identity Management chapter for more information.